Patients with severe valvular heart disease who undergo replacement of one or more cardiac valves have increased survival, enhanced function, and improved quality of life relative to similar patients who have not been operated on (1,2). Despite the success and consequent wide application of this therapy, for an individual patient there is often considerable uncertainty regarding the optimal timing of surgery, appropriate prosthesis to use, and ultimate prognosis (3,4). Progressive myocardial degeneration arising prior to and not correctable by surgery may contribute to early mortality or may be responsible for late deterioration (5). Such damage may undermine the otherwise beneficial effects of hemodynamic adjustment obtained by removal of damaged valves and their replacement by prostheses. 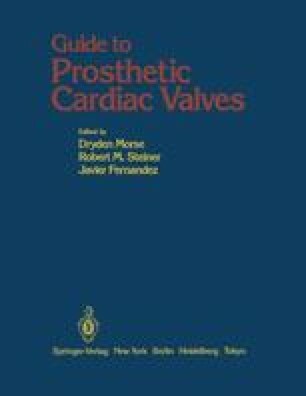 Artificial valves may also be associated with important complications.